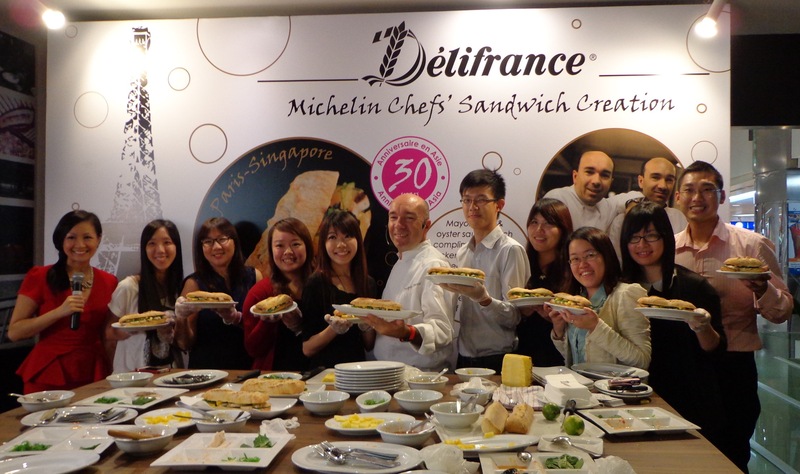 To commemorate 30 years of authentic French bakery fare in Asia, Delifrance partnered with renowned 1-star Michelin chefs Jacques and Laurent Pourcel to launch its first-ever Michelin sandwich “Le Paris-Singapore”. When I received the invitation to attend the launch, I knew it was going to be a fun experience. It’s a rare opportunity to get up close and personal with a Michelin-starred chef and to top it off, we got a hands-on lesson on how to put the sandwich together and the inspiration behind the creation. 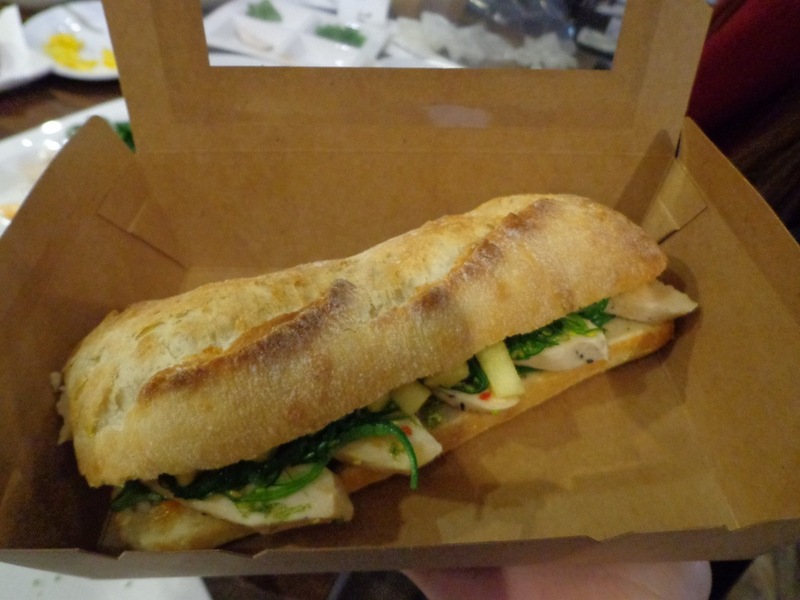 Le Paris-Singapore is a special sandwich. Inspired by their travel experiences in Asia, it is specially created by 1-star Michelin chefs Laurent and Jacques Pourcel for Delifrance. This is not the first time the twins, who run the famous restaurant le Jardin des Sens in Montpellier, France, collaborated with the French bakery. In 2010, when the chef twins were chosen as ambassadors to represent French gastronomy at the World Expo in Shanghai, they had chosen to use Delifrance breads for the international event. “When we were looking for a supplier for this unique event, we wanted to combine quality and French know-how. Delifrance’s breads and viennoiseries were a natural choice,” recalled Jacques, who was in Singapore to launch the new creation Le Paris-Singapore. In an artisan mix of French bakery and Asian flavour, Le Paris-Singapore is buttered with mayonnaise and oyster spread, layered with a bed of French baby spinach and Thai chili roast chicken, with Wakame (Japanese algae) and pineapple slices to complete the taste. Specially imported from France, Delifrance’s French stone-baked rustic baguette spent 10 hours in the oven; baked to perfection, light and soft inside with a delicate aroma of fresh cream and sweet almond. 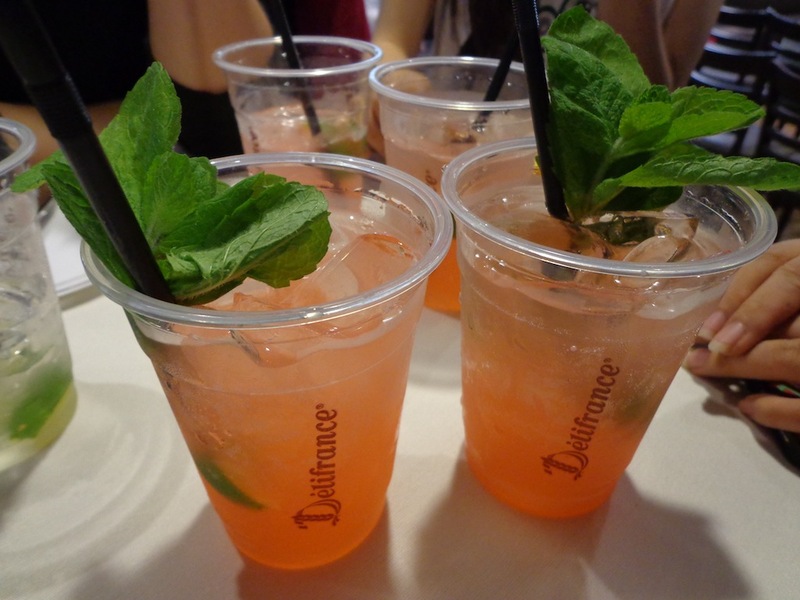 Completmenting the new Michelin-starred sandwich, Delifrance has also partnered with French beverage company Monin to introduce two special sparkling drinks, Le Spicy Mangue Collins and Pink Grapefruit & Elderflower Spritz, which customers can pair with Le Pasir-Singapore sandwich. Le Spicy Mangue Collins is a thirst quenching sparkling blend of mango and lime with a slight hint of chili. Pink Grapefruit & Elderflower Spritz is a light and refreshing combination of ripe pink grapefruit and subtle elderflower. Le Pasir-Singapore is available a la carte at $10.80 or enjoy it with Le Spicy Mangue Collins or Pink Grapefruit & Elderflower Spritz for just $12.80. 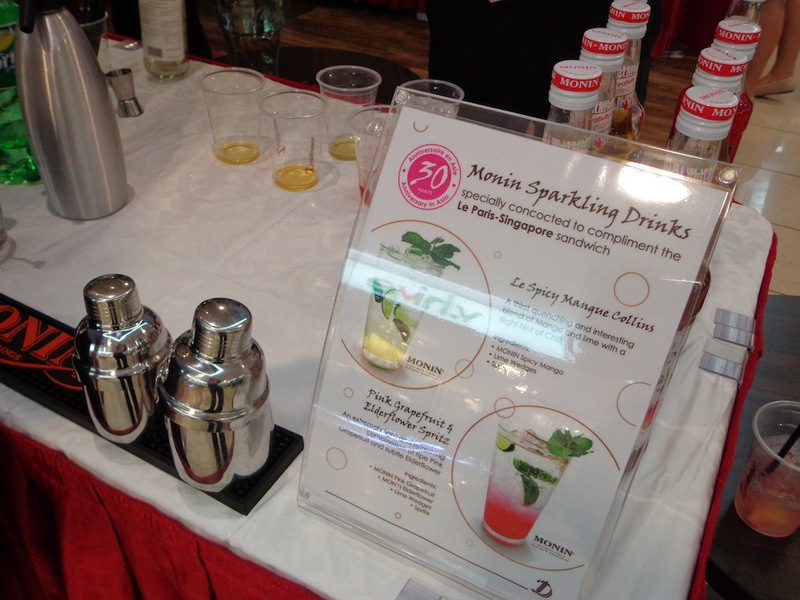 The sparkling drinks are also available a la carte at $5.00 each. 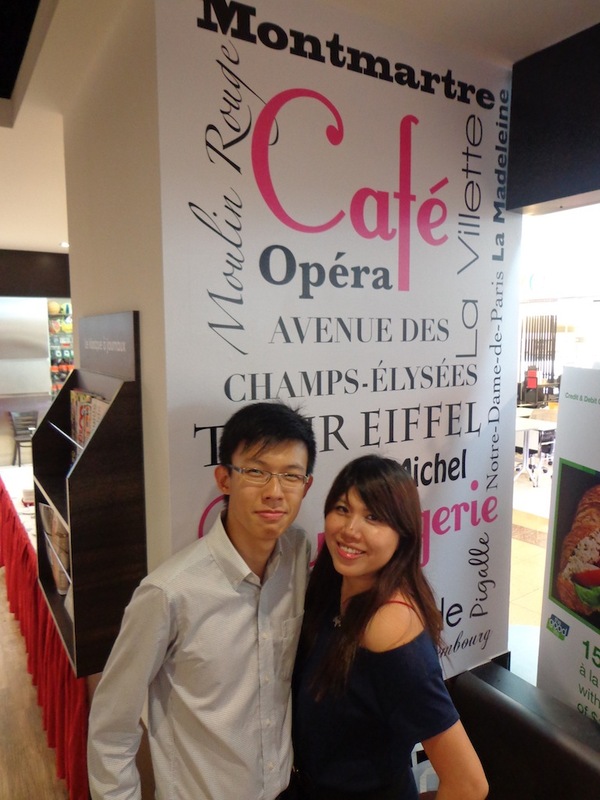 As part of the 30th Anniversary celebrations, Delifrance’s customers, who spend a minimum of $10 at any Delifrance outlet between 1 June and 31 August 2013, will be able to enter “Experience the French Art of Living” lucky draw. One lucky winner will walk away with prizes worth more than $6,000 including a pair of economy class return tickets to Paris, 3 nights accommodation in Paris and one-day French baking class at The Paris Bakery and Patisserie School by Grands Moulins de Paris, parent company of Delifrance Group. SMS your details in the following format to 9010 2322: Delifrance <space> Name <space> NRIC/FIN number <space> Receipt/bill number <space> Email. This entry was posted in Contest, Food, Singapore and tagged 1 star michelin, 30 years in asia, contest, delifrance, delifrance group, delifrance singapore, experience the french art of living, french baby spinach, french bakery, french cuisine, french gastronomy, french sandwich, grands moulins de paris, jacques and laurent pourcel, jacques pourcel, japanese algae, laurent and jacques pourcel, laurent pourcel, le jardin des sens, le paris singapore, le spicy mangue collins, lucky draw, michelin chef creation, michelin chef sandwich, michelin star, michelin starred sandwich, monin, monin sparkling drink, montpellier, paris, paris bakery and patisserie school, pink grapefruit and elderflower spritz, sandwich, sparkling drink, stone baked baguette, thai chili roast chicken, viennoiseries, wakame, world expo shanghai. Bookmark the permalink.